I don’t argue much with an Atheist, as they have a very good argument in place! How can you prove to someone that something exists which cannot be seen, heard or touched. Basically they have won the case, end of story you would say. Which brings me to the question which one evangelist mentioned, “why should we always prove to an atheist there IS a God, why cannot an Atheist prove that there is NO God”. An atheist moves on with life, but it seems that we Christians feel a burden, that we should prove somehow to the atheists that they are missing the best of present life and after-life by not knowing a God. Lawyers probably may know this, It is like a prosecutor and the defendant. The prosecutor has to do the harder job by trying to convict while the defendant has the easy job of defending, all he has to do is it create a doubt and sometime not even a proper case, in other words confuse the court and you have a hung jury and the case is dismissed. It is also like when someone finds a great good news and you meet someone you care for, you just want to share it openly with love. Recently I was trying to explain a few points to a friend of mine who an atheist, on why he should believe in God. His reply to me was “Hey mate, I will send you some great literature on a few atheist scholars and you should listen to them, after your heard the tapes then you tell me your view”. I told him I am definitely not interested in listening to the tapes, as I have found the love of my life. It is like when you are happily married you advise a friend on how to lead a good life, instead he tells you, “you must cheat on your marriage it is the best feeling ever, please don’t preach to me, instead you please cheat for one week and then you give me your view”. I have found the best thing in my life, why in the world would I want to dilute or haze my thoughts by listening to tapes? A belief is driven by a need, a need is driven by circumstance, circumstance is not driven by anything, it comes to you opportunities, we don’t create or invent it. The short and sweet answer is unless God decides to open your eyes and reveal himself to you, you will never be able to know him. You will never be able to sit and prove that there is a God to an atheist, that is a lost battle, it is a lost argument. If an atheist has to believe that there is a God, he has to believe that spontaneously from within, not from outside, in order for that to happen, we have to follow the process which is circumstances, need and belief. Circumstance is created by God. I had once a non-Christian friend who used to smoke a lot, I told him several times to quit in every way possible, he always laughed it off, finally he had a heart attack, that made him realize his error as he came close to death. Now he walks around preaching to everyone not to smoke. Some circumstance had to happen to him for him to realize on his own his erroneous ways and he corrected himself within. You wake up in the morning, start with the simple things, the sun rays, the mist, the birds, the sounds, the smells, the flora, the tree, the leaves, what a beautiful world! it is a complex architecture of matter, space, mind, life, colors, it is cannot be even explained in words. Are we saying that all this was self-created? There was no creator but it just popped out of nowhere. The beauty is too deep to ignore it, the beauty is too complex to dismiss. One famous theory is Big bang, I have not studied it much, but in essence what it says in summary is that, the earth was created by a collision of planets and over time all what we see was self-created, If that was the case how can there be a structure / order in everything, if Big bang was true, it would be like giving 10 blind artists a pallet and asking them without speaking and coordinating to draw up a beautiful painting! You will see a wall of random patches you will not find any pattern or order. Our body, flora, fauna everything has a beautiful pattern in place, the Sun is a perfect round, the ice crystals although no two are same has a beautiful pattern within them. the leaves can be beautifully split in two. In everything there is an order. First the bud comes out, then the stem, then the leaves, then the tree. There is beauty in the biological creation stage of a child is given birth and how it goes through different phases of maturity , learning and then comes a stage of procreation in his/her life & there is waiting period, before a new life is born. It does not happen the other way around. Night does not start the day, the morning does, Sun does not light the night, the moon does. The clouds form then there is a rain, an order is in place! Just the thought of a random collection of even producing this beautiful structured and ordered world is impossible. However way you look at it. One famous theory is that man came out of Apes. let’s say this was true for a moment. You know how many changes an Ape has to go through to become a man? he has to change physically, he has to learn to talk, eat, laugh, joke, cry, he has to learn to dress, earn, wash, brush. then he has to learn to live, produce, work, then he has to drive, ride, relax, then he has to learn to invent, produce, industrialize, then he has to learn to fly, sail, then he to learn to create the computer, type, phone, text. Let’s put a probability factor for each of these scenarios, which can run into million, basically the difference between you who is reading this article and an Ape who is in the jungle. Each probably has a yes or no possibility. we are assuming that every possibility is a yes, so that an Ape did turn into Man of today. Do you know what that probability is? Basically you cannot even count or image it. Wake up! Let’s say even all that millions possibility did happen? Why are there Apes still around? Why cannot we find a sub species which just came quarter way or half way. Why can we still find the Ape as an Ape and Man as Man together? Why would all the animals be still animals and one specific passing a probability factor of billions rule everything. I have spoken to a few atheist, most of them say “if there is a God why is there so much evil? So much hurt and starvation, so much bad things happening around, why does he not stop it surely he does not so there cannot be one”. Interesting! Well for starters even that question poses the fact that there is a God. How do you know that God is not preventing the bad, do you know what is bad? did someone teach you what is bad? If something hurts you is it considered bad? How do we know the definition of bad and good, evil and non-evil. If we had no God around, does it matter what we think, sure when we see something and we are programmed to recognize through birth that it is not good or it does not feel good, but does it really matter, after all we are all cosmic residue. The fact they one can ask the question clearly shows that the is a preconceived notion of Good and Evil, where did that come from? From God, the bible clearly mentions the story in detail. why is there Evil, yes we are all given certain instructions in life, when we disobey them knowingly or unknowingly problems happen and then we have real worries. Lets say there is a speed limit, you don’t follow that, you drive like a maniac meet with an accident and injure some other people, can we blame God for everything? Evil is done by Man to Man, why does God not stop this? he has given man freewill he can do whatever he chooses, he has to also face consequences. Grow up don’t be like a child. when you grew up there were rules in the house right? What happened when you disobeyed them, some problems start happening. Same thing happens in adult life. We as humans love to ignore the unknown and embrace the known. We are afraid to seek the unseen and delight to live with mediocre of the seen. One evangelist mentioned that Atheist loves to practice atheism because they can do the wrong thing without feeling bad! This is true in a sense, another evangelist mentioned that if you are atheist why even bother to do any good, just may as well do what you please without considering anything for anyone and die before your time as you are cosmic muck. Which was a result of a collision of galaxies, you are a random existence. why even have a conscious, why even be considerate? Why do any good? It will not make any difference to you, at least not while you have your atheism belief. Those who matter to you, those you love, those who love you back are all random galactic particles, so why bother to even live? Even I was an atheist when I was young and I had the life before me, I just thought to myself, let me have some fun, after all how can I believe in something which I don’t see. but as over the years I picked a grey hair or two, as picked up a wrinkle or two, as I conversed with people from different walks of life. as I laughed, cried, got hurt, shared joy I started realizing life has something much more powerful that I cannot see or touch. The I slowly started finding the truth seeking it and finding it. it came from within. Even today I have many questions but slowly I see that there is a God, a power putting this altogether in a beautiful way. A power which existed, which exists and which will exist. it is much more than I can comprehend or imagine. As I becomes less that power becomes more within me. 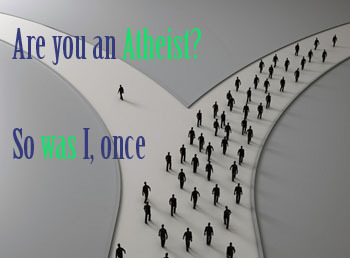 If you are atheist, this article was not written to convert you in anyway. The fact of the matter is I cannot convert you, you have to convert yourself and you cannot do that unless God opens that conversion door. You may probably say I don’t need conversion my friend, you do! You can live your life the way you are now living and just move on, but one day just before you close your eyes for the final time, you will need to face this question? Is there a God? Is there more to life that what I see? I just hope for your sake that that day does not come! because all your life would have been a waste if you were wrong! i have decided to follow jesus………..